QClick is the most powerful and cost effective Interactive Wireless Audience Response System on the market. So easy to learn and fun to use, assessment is made precise & efficient with the QIR300. Not only does the Infrared QClick system completely integrate into Microsoft® PowerPoint, but it also can be used over any application you want to test- from paper exams & oral quizzes, to flash files & websites on your PC. Use it in a classroom, at a training session, or in corporate meetings. 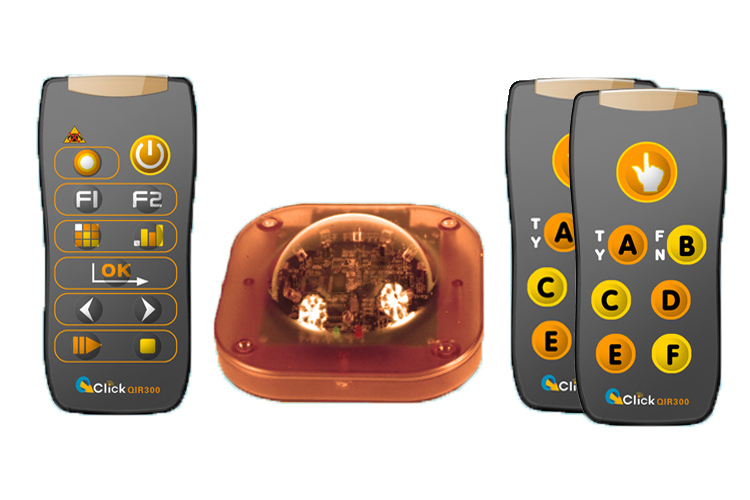 With QClick’s wireless audience keypad assigned to each participant, real-time feedback can be electronically collected at the simple CLICK of a button. Now proudly partnered with Blackboard, Technology & Solutions Built for Education. QClick Reporting can easily identify concept weaknesses for individual students or entire classes. Various activity modes allow for in-class games. QClick software runs together with PowerPoint. It is very easy to learn and use. QIR300 system includes: student remotes (12, 24, 32, or custom class sizes available), one teacher remote, an Infrared reciever (students and teacher will need line of sight with reciever), carrying case. QClick Quiz Genius is used to load student names and load the quiz file. QClick Exam Editor allows you to edit the quizzes and select the correct answers. QClick Template Designer can be used to give your slides a custom look and feel. Instant Results and Reports - Generate charts and bar graphs with class results. Unique ID number for each remote. This ID number can be set or reset anytime by the instructor. The wireless IR receiver easily connects to your computer through USB. The USB Device driver is compatible with Windows only.